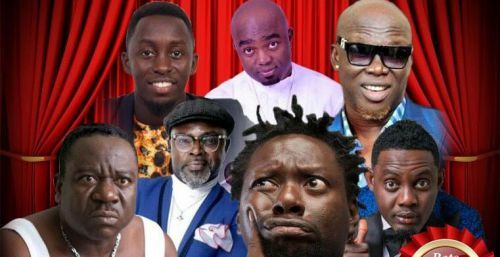 Internationally rated rib-cracking comedians and movie stars are due to arrive in Accra for the Corporate Golden Comedy and Dinner Dance Show slated for the 23rd of December, 2017. Speaking to this paper, the Managing Partner of the show, Mr. John Bosco Tieyiri, said the marked awaited comedy show will take place at the serene ambiance of the poolside and the golden gardens of Golden Tulip. According to Mr. Tieyiri, the show is being organised by CIX Production and Golden Tulip, in collaboration with CIBDev Consult Ltd. He was upbeat that the show is a tailor-made and will draw participation from corporate Ghana and bureaucrats as well as the working public to the serene ambiance of the 4-Star Hotel to laugh, dine, wine and dance as these rib-cracking comedians are expected to thrill this special audience to hilarious stand-up comedy. Also on the bill, according to the organisers is the most celebrated live band group, the Naked Truth Band to administer soul’s awakening melodies of Ghanaian music retrieved from the old diaries of our forebears. It was also confirmed to The national Tribute that while the event is expected to attract many high profile personalities from both corporate and public circles, the Eze-Igbo Ghana (the Igbo King of Ghana) and the Yoruba community are anxiously gearing up to welcome and support their sons and brothers, whom, they described as trail blazers of their homeland. Mr. John Bosco Tieyiri was emphatic that the show, which has been instituted to be the biggest entertainment gathering for corporate executives, management and staff of companies as well as public and the general working class of the public, is to create a unique and relaxing platform for those, who are exposed to the dangers of work related stress, to manage their working lives properly. In fact, experts strongly argued that comedy decreases stress hormones and thus improves one’s resistance to disease and also cuts medical bills of companies. These researchers further argue that comedy produce endorphins, which are body’s natural feel-good chemicals that promote an overall sense of well-being and can even temporarily relieve pains. Supporting this argument, a survey of about 800,000 workers in over 300 companies in the United States, shows that the number of employees calling in sick due to work related stress conditions tripled from 1996 to 2000. Again, in a related study, an estimated 1 million workers are absent every day due to stress. The European Agency for Safety and Health reported that over half of the 550 million working days lost annually in the U.S. from absenteeism are stress related and that one in five of all last minute absenteeism is due to work related stress. Going by these statistics, it is therefore, prudent for companies’ staff and management as well as families and workers in general to have regular exposure to such shows to improve workers’ lifestyle and cut medical bills. 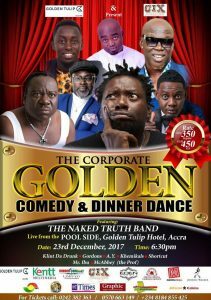 Tickets for the maiden Corporate Golden Comedy and Dinner Dance are currently on sale at Golden Tulip Front Desk, Silverbird Cinema, Airport Shell and Baatsona Filling Station. Rest are Koala, Osu and Spices Restaurant, Dansoman Roundabout. Special delivery arrangement is available for corporate buying. PreviousStonebwoy Bhim Concert ‘Epistles of Mama’ Was Sooo Lit!